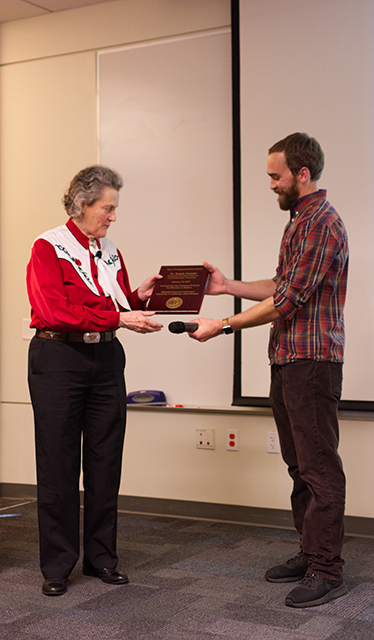 At the invitation of Michael Hughes and the Graduate Students for Diversity in Science, Dr. Temple Grandin spoke at UCSB on January 26, 2017. We’ve uploaded a video of her full speech here. Dr. Temple Grandin is a world renowned autism spokesperson and a consultant to the livestock industry on animal behavior. Her groundbreaking work has allowed half of all the cattle produced in the US today to go through a feedstock yard designed by her, ensuring improved quality of life and death. Michael Hughes is a third year graduate student at the department of Chemistry and Biochemistry at UCSB. He is currently working at the Thuc-Quyen Nguyen lab on the characterization of organic solar cells. As Temple’s host, Michael arranged her visit to UCSB for the GSDS Dow distinguished diversity lecture series. Michael recounts the intimate conversations with Temple during her two-day visit to UCSB. 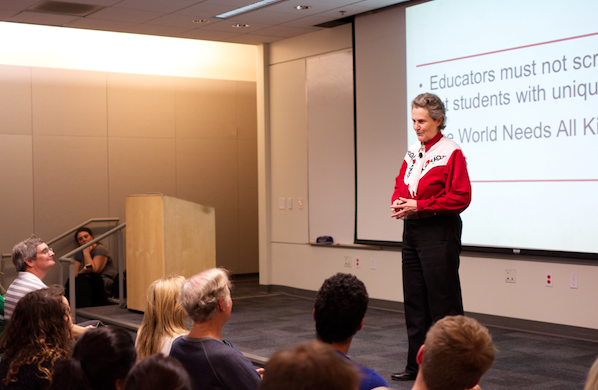 During her short stay at UCSB, Temple Grandin emphasized the importance of redefining and reconsidering the ways in which the world thinks of “different”, discussed and shared relevant ideas that can help make the world a better place, and talked about why we really need all kinds of minds in our world today. What gave you the idea to invite Temple Grandin to UCSB? I share an office with Niva Ran, who was the president of GSDS last year. A while back, we got into a conversation about seeking invited speakers to GSDS who can share insight on diversity in science. At the end of our conversation, Niva asked me who I would invite as a speaker, if I could. Off the top of my head I said Temple Grandin, who has been one of the biggest heroes in my life. I wasn’t a part of GSDS then, so I actually joined because I wanted to see if Temple would come. Given Temple’s prominence, did you think she would respond when you first emailed her to speak for GSDS? What were some of your first communications with her like? It was wonderful because I nominated Temple, after which she was chosen by GSDS as a possible candidate. I then had an opportunity to personally write her a letter and invite her to UCSB, which was stressful for me, because I was communicating with someone I had looked up to for a long time. I was overwhelmed by the quickness of her response and how open she was to coming to UCSB. I reached out through her secretary, but got a response immediately from her, followed by a phone call from her. How involved did you have to be to get her to come here? I don’t really know how the whole GSDS invited speaker process works, so can you tell me more about it? GSDS has a team of executive members that handle invited speaker events. As Temple’s host, it was my responsibility to reach out to her. It was then mostly the GSDS executive members who arranged meetings however, they kept me in the loop about the event. I was also invited to speak in front of GSDS members a week before Temple’s talk to share my involvements with people who experience autism, so the group would be more educated about it. My role as a host began when Temple arrived. It was really nice because what we were able to offer her as a gift for coming was much less than what she would traditionally get, but it didn’t seem to phase her. One of the requests she had, was to not have to change flights. So, I got to spend an incredible amount of time driving her to and from LAX, which was truly a once in a lifetime experience for me. What do you think was different about her talk? Temple Grandin being here was a special case because it was the first time that someone who experiences autism came to speak for GSDS. It was a nice opportunity to allow people in the sciences to have a better understanding of people with autism. As Temple also pointed out during her visit, science is filled with people on the spectrum and passing this knowledge on allows us all to be more inclusive, which is the primary goal of GSDS. Based on your initial interactions with Temple, what was your impression of her? Did you have an expectation of how meeting Temple would be like? I was excited and nervous simultaneously, but I really had no idea what to expect. She introduced herself, told me she liked my truck, and it was really very comfortable to be around her after that. The conversations with her were easy and interesting. She has so many insights and the breadth of her knowledge is amazing. You said you had a long car ride to and from LAX with Temple. Would you share with us some interesting stories while spending time driving Temple around? The three days I spent with Temple Grandin was the rainiest that Santa Barbara has seen in a long time, and it created a whole element of adventure during her trip. After I received her at the airport, we started to drive out of LAX which was kind of a horror show—the traffic was terrible and we got re-routed through the heart of LA. The whole time it was pouring cats and dogs, but she was at ease. We had parked in the disability slot at the airport, so she immediately asked me with a laugh when she got in: “Who’s in the wheelchair?” Her honesty and directness promotes the like so I told her my personal story regarding suffering from a chronic pain condition. Thirty minutes after that, she was engineering a way to fix my pain. She wanted to see X-rays, and also talked about designing insoles to help my back and leg. She thought of experiments I could do to optimize the system and inexpensive ways to make it. She showed this incredible empathy and compassion, but her approach to all of it was so practical. It’s not everyday that one gets to interact with someone with autism, which is a shame because as Temple says all the time, the world needs all kinds of minds. We got hungry on our drive back from LAX at about the halfway point to Santa Barbara. We couldn’t really find a place, since we didn’t know where we were, and since we all were hungry, we just needed to eat. So we stopped at an Applebee’s in Oxnard. Temple said she wanted to try something new, so she ordered the “Triple Hog Dare”, which contained bacon, ham, and pulled pork on a sandwich, and it didn’t look very appetizing. Because of our hunger, however, she ate it quickly- before all the food had reached the table. The manager then came over to check in with us, and she replied saying that the “food tasted like garbage.” The manager turned away, a bit embarrassed and left our table. We continued to talk about different ways in which the meat industry makes pulled pork. Another waitress came by our table, and said: “I heard the food didn’t taste very good.” And Temple again replied to it saying: “Yeah, because it tasted like garbage.” We could see that the wait staff standing on the other side were looking at and talking about us. But I could also see that it really wasn’t Temple’s intention to hurt anyone. She was simply saying the truth to a question posed to her. It was interesting because there was a clear communication disconnect, but her intentions were to tell them simply that the sandwich wasn’t good. Through the rest of the meal we were laughing, joking, and looking up cement mixers that make pulled pork. At the end of it, I told her: “You know Temple, you have the whole wait-staff petrified, and I’m sure they have no idea how famous you are.” She helped herself to my fries which was fine with me; it’s not everyday that you get to share a snack with an American hero. That was how the rest of the interactions with Professor Grandin went: as though in the intimate comfort of old friends. Did she have interesting stories about how the ‘Temple Grandin’ movie was made? Have you watched the movie? It was during an early lunch with Temple where we got to talking about her movie “Temple Grandin”, which was a very rare opportunity for me because it’s not a common experience to have lunch with someone who has had a major motion picture made about their life, during their life. Her first response to being asked what it was like to watch a movie made about herself was: “It’s like going back in time on a time machine.” She also said that the representation of her by Claire Danes has forced her to not watch any of the actresses’ work, because Claire’s portrayal of herself was so uncanny, even for her. We got to ask her about the academy awards and her response was that it is a lot like a convention rather than a party, and people don’t really drink there as much you’d think. She said that one could easily get wrapped up in the glitz and glamour of Hollywood, especially if they were impressionable, but for her, it was just something she had done. She recalled the flight back from the Hollywood experience as coming back to reality. After being pampered and waited on during her time at Hollywood, she recalled coming back on a flight in a middle seat next to the bathroom (possibly the worst seat on the plane). But that is where she likes it, down to earth and in the mud. She is incredibly honest and doesn’t have any intentions of her fame and success getting to her head. That night, I went home and watched the “Temple Grandin” movie for the first time. I was so thrilled to watch the movie after meeting her, because I could see how well they captured her spirit and nuances in the movie. I was blown away by how well Claire Danes personified Temple. Can you tell us about Temple’s talk? What did you think of it? Before saying a single word, her talk was so moving because every seat was filled and there were many people standing shoulder-to-shoulder just to watch her speak. What was so touching was that it wasn’t just scientists or graduate students, it was people from all walks of life; people who clearly weren’t affiliated with the school, but just wanted to hear her talk. There was a collection of all kinds of minds, and all kinds of interpretations of her talk. There were people with autism, people who knew somebody with autism, people who studied the physical sciences, and people who studied human sciences. There was just such a huge diversity in the people she brought ranging from: the education department, the psychology department, and many people who hadn’t come to GSDS talks before. It gave GSDS an opportunity to start reaching out to more people while broadening our concept of diversity. Her talk was great because even though Temple has done many talks before, she incorporated conversations she had with people she had met at UCSB, including myself, which was incredibly humbling. After her talk, I was amazed by how many people stayed back to talk to her and listen to her stories. People gathered around to shake her hand and get more advice and help from her. There was just such a sense of caring, helping, and sharing from her side and it was infectious. Somebody I hadn’t met before from the audience even thanked me and gave me an autographed copy of a children’s book he had written to give to my 5-year-old daughter. What was the best part about spending time with Temple? Is there one main thing about her that has stayed with you? The experience of meeting Temple Grandin absolutely changed my life. Altogether, I would say I spent about 10 hours in conversation with her. There were times where I was even debating with her ideas, which she welcomed. One of the things that has stayed with me was the concept she shared about ‘project loyalty’, which centers around the idea that: You may lose a battle, but never give up on the war. It’s about creating a specific goal and not allowing anything to stop you from reaching it, obstacles are merely a path to success. Project loyalty was something she created by utilizing her autism as a strength. It was clear to me that she doesn’t see autism as a disability, but as a strength. It allowed her to see the world differently and make changes that no one else could. Her approach was that regardless of how you see the world, utilize your perspective to make the world a better place. I reflected on this and realized that so many problems in my life that I saw as insurmountable were problems that grew in my mind. The idea of not seeing problems, but only your final goal and focusing on that has changed my approach to graduate school, and life. What do you think were some of your takeaways about Temple that you think are important for everyone else to know? My largest takeaway from her time here is that we, as a human civilization, need to redefine and reconsider the way we think of “different” and “normal”. The truth is, that all the world is on a spectrum and that shouldn’t make us categorized and separate—but rather unique and special. If we can tap into our differences, and allow them to shine and be our greatest attribute, rather than a deficit; we can do so much more. Temple faced so much discrimination just to get into the conversation of animal welfare. Now, to see that half of all the cattle produced in the country go through a feedstock yard designed by her to make the lives of animals better and more ethical, reiterates the amazing impact she has had on so many lives. Dr. Temple Grandin changed this world, because she embraced in herself, that which makes her different.